‘Pra Rahu‘ is the Deity of Fate and Fortune, and the Astrological Ruler of the Dark Phases of the Zodiac. He is an Asura type Deva of the heavenly Realms, and is the God of Eclipses, seen to have strong influence on Horoscopes, much like the planet Saturn does in western Astrology. Pra Rahu is a Personification of Higher Powers in force, and is seen as a Deity by Thai Buddhist People, to worship in order to turn the line of fate and improve karma, appease angry gods, and to remove obstacles. As legend tells, Whoever tries to Kill Pra Rahu is Thwarted, for he just remains Alive, being an ‘Immortal’ God. Piti Buang Suang Bucha Pra Rahu – Ceremony to pay reverence, offerings, prayer and Chanting to the Rahu Deity for improvement of Horoscope and cleaning of negative Fate. 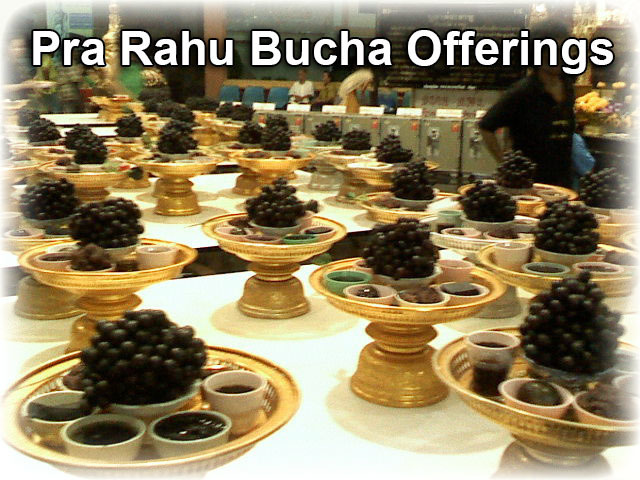 When you begin to Bucha Rahu Deity, you should make the first ever session in the evening of a Wednesday (any time from 7 pm onwards).After you have done this once, you can make Bucha in the daytime if you wish, but the first time you must include the food offerings of black foods as well as the black incense. The second time onwards only the incense is necessary in the daytime if it is a lot of trouble to get the food offerings. 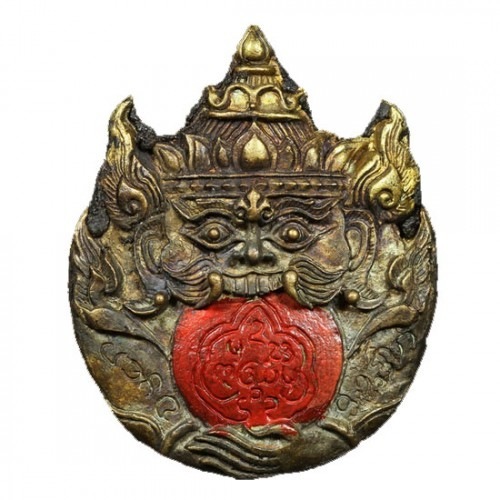 To make a powerful Bucha to Rahu, it is recommended to have a Rahu image, statue or amulet to use as object of focus whilst praying to the Deity and chanting the Kata. 1 Pings/Trackbacks for "Kata Bucha Pra Rahu Deity"